The SNP has called for an end to explosives being detonated in the sea around Scotland following a report into the deaths of 19 whales in 2011. The Department of Environment, Food and Rural Affairs (Defra) study suggested military activity may have harmed the long finned pilot whales. The 19 were among 39 that stranded at Kyle of Durness a day after three explosions at nearby Cape Wrath. The Ministry of Defence (MoD) said it accepted the report's findings. 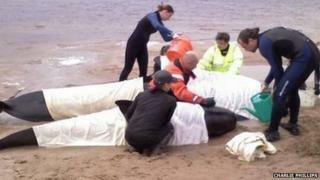 Seventy distressed whales were spotted in the shallow waters of the Kyle of Durness on 22 July 2011. Despite attempts by rescuers to coax them back out to sea, 39 were left stranded by the tide. Defra's report into the incident said that three 1,000lb (454kg) explosives were exploded underwater at the nearby Cape Wrath military firing range the day before the stranding, while there was another blast shortly after the animals got into difficulty. The report said it would be reasonable to conclude that these underwater detonations may have had a significant effect on the behaviour hearing and navigational abilities of the animals. Rob Gibson, SNP MSP for Caithness, Sutherland and Ross, said: "This report confirms what we already suspected but the Ministry of Defence tried to cover up - the detonating of bombs led to the whales being deafened, forced off course and dying on the beach at Kyle of Durness." He added: "The efforts of the local people in the Kyle of Durness to save the beached whales were incredible - but sadly the animals could not be saved and many died. "Scotland's seas are blessed with many marine mammals, including more than 20 species of whales, dolphins and porpoises. It is our responsibility, where possible, to do all we can to protect these wonderful and popular species." He also criticised the length of time it had taken for the report to be published. A spokesman for the MoD said: "The MoD accepts the findings of the Durness Mass Stranding report which identified a number of possible factors that may have influenced events, one of which was the detonation of underwater explosives. "The recommendations will be considered by the MoD and implemented where appropriate. "Additional mitigation has already been put in place during munitions disposal activities conducted since 2011."